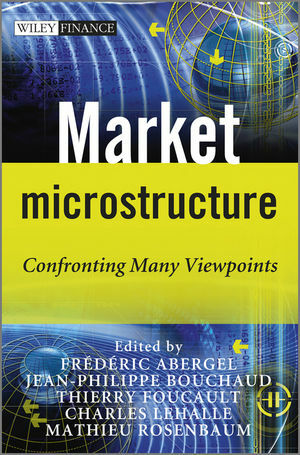 Based on the December 2010 conference on market microstructure, organized with the help of the Institut Louis Bachelier, this guide brings together the leading thinkers to discuss this important field of modern finance. It provides readers with vital insight on the origin of the well-known anomalous "stylized facts" in financial prices series, namely heavy tails, volatility, and clustering, and illustrates their impact on the organization of markets, execution costs, price impact, organization liquidity in electronic markets, and other issues raised by high-frequency trading. World-class contributors cover topics including analysis of high-frequency data, statistics of high-frequency data, market impact, and optimal trading. This is a must-have guide for practitioners and academics in quantitative finance. FRÉDÉRIC ABERGEL graduated from École Normale Supérieure with a PhD in Mathematics. He started an academic career as a researcher with the CNRS. He spent ten years in the Mathematics department of the University of Orsay Paris XI and then switched to the capital markets industry and became a quantitative analyst. He has worked for trading floors in various financial institutions, mainly in the derivatives sector, developing pricing and hedging models. He now holds the BNP Paribas Chair of Quantitative Finance at École Centrale Paris. His research focuses on the study of empirical properties and mathematical models of market microstructure, high frequency data, algorithmic trading. JEAN-PHILIPPE BOUCHAUD graduated from the École Normale Supérieure in Paris, where he also obtained his PhD in physics. He was then appointed by the CNRS. After a year spent in the Cavendish Laboratory, he joined the Service de Physique de l’Etat Condensé, where he worked on the dynamics of glassy systems and on granular media. His work in finance includes extreme risk models, agent based simulations, market microstructure and price formation. He went on to found the company Science & Finance that merged with Capital Fund Management. He is now the President and Head of Research at CFM, and professor at École Polytechnique. He has published over 250 scientific papers and several books in physics and in finance. THIERRY FOUCAULT is Professor of Finance at HEC, Paris where he received his PhD in Finance. He is a research fellow of the Centre for Economic Policy. His research focuses on the determinants of financial markets liquidity and the industrial organization of the securities industry. His work has been published in top-tier scientific journals, including the Journal of Finance, the Journal of Financial Economics, and the Review of Financial Studies. He acts as co-editor of the Review of Finance and he is an Associate Editor of the Review of Asset Pricing Studies. For his research, he received awards from the Europlace Institute of Finance in 2005 and 2009, the annual research prize of the HEC Foundation in 2006 and 2009, and the Analysis Group award for the best paper on Financial Markets and Institutions presented at the 2009 Western Finance Association meetings. CHARLES-ALBERT LEHALLE is the Head of Quantitative Research at CA Cheuvreux and is an international expert in optimal trading. He published papers in international journals about the use of stochastic control and stochastic algorithms to optimise a trading flow with respect to flexible contraints. He also authored papers on post trade analysis, market impact estimates and modelling the dynamics of limit order books. He lectures at Paris 6 (El Karoui) Master of Finance (École Polytechnique, ESSEC, École Normale Supérieure) and MASEF/ENSAE, and gives master classes in the Certificate in Quantitative Finance in London. He holds a PhD in Applied Mathematics and his core fields are stochastic processes, information theory and nonlinear control. MATHIEU ROSENBAUM gained is PhD from University Paris-Est. He is now Professor at University Pierre et Marie Curie (Paris 6) and École Polytechnique and is a member of the CREST (Center of Research in Economics and Statistics). His research mainly focuses on statistical finance problems, such as market microstructure modeling or designing statistical procedures for high frequency data. He also has research collaborations with several financial institutions, in particular BNP Paribas. 1.2 What is algorithmic trading?